Baugh's Blog: Book Review: Charles Dickens 2 - "The Pickwick Papers"
Charles Dickens’ first book, Sketches by Boz, was published as a two-volume collection by John Macrone on February 8th, 1836. Two days later, the up-and-coming author received a visit at his Furnival’s Inn lodgings by William Hall, one-half of the London publishing house of Chapman & Hall. He had a book proposal to make to Dickens. Chapman & Hall were planning to publish a book of “cockney sporting plates”, featuring illustrations by Robert Seymour. They needed a writer to provide a group of sporting stories to accompany Seymour’s sketches. Their concept for the book was an account of a group of like-minded sporting fellows called the “Nimrod Club”, traveling around the country, fishing and hunting, and sharing misadventures in the hinterland outside the capital. The book would be a sort of picture novel, with Dickens providing “letterpress” - extended captions for Seymour’s plates. Seymour was the experienced one; Dickens would definitely be the junior partner in the team. Although he wasn’t too excited by the idea – it was a familiar and rather tired concept – Dickens nevertheless seized the chance to participate in another book. Chapman & Hall proposed monthly issues consisting of four illustrations by Seymour and one-and-a-half sheets of text. Dickens would be paid 9 guineas per sheet. A sheet was cut into 16 pages; so he would be writing 24 pages for each month’s instalment (12,000 words) – longer pieces than he’d ever tackled before. He began writing on the 18th of February. The writing came easily. The first instalment was published on March 31st - the full title being: The Posthumous Papers of the Pickwick Club - Containing a Faithful Record of the Perambulations, Perils, Travels, Adventures and Sporting Transactions of the Corresponding Members. Just 400 copies. It had green end papers - "wrappers". Each month’s issue was priced at one shilling. Dickens’ name still did not appear on the title page. “Edited by ‘Boz’”, read the credit. He was 24 years old. But the early days of this new enterprise were thrown into confusion by the sudden death of the artist, Seymour - who shot himself after the second issue. Robert Buss was brought in to take over as illustrator for the third instalment. Dickens persuaded the publishers to reduce the number of pictures from four to two, and to increase the text by half a sheet – from 24 pages to 32. He was now in full control: the artist was now illustrating the text, rather than the writer captioning the pictures. Buss didn’t work out, so Chapman & Hall hired Hablot Knight Browne, who took over for the fourth issue, and did the engravings for the rest of the book. He took on the pseudonym “Phiz” to match Dickens’ “Boz”. They worked well together, and Phiz would illustrate for Dickens over the next 23 years. The original title of the work - The Posthumous Papers of the Pickwick Club - gives a sense of the intended tone. 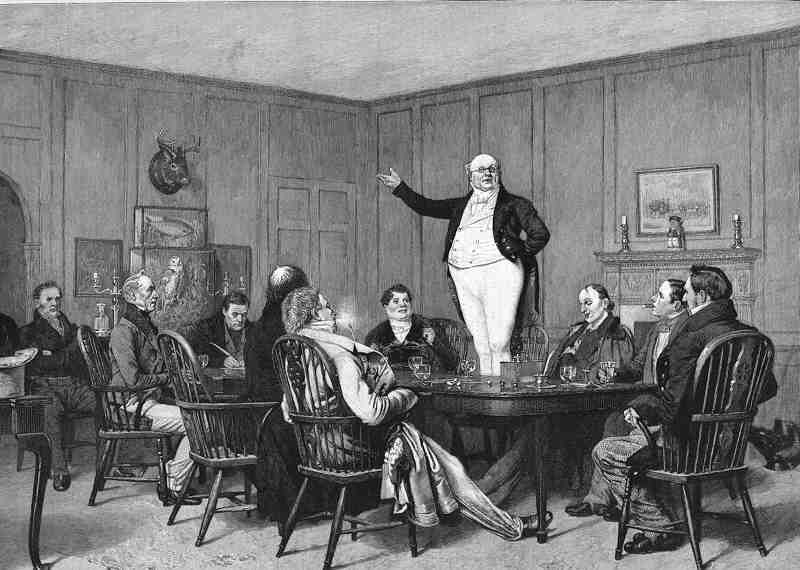 Dickens’ narrator was to adopt a kind of lofty, supercilious tone as he described the silly antics of this motley crew of middle-aged bachelors. It took a while for the book to take off; the early sections seem to wander aimlessly as the author struggles to find a settled tone, and a unifying theme (once he had abandoned the publisher’s initial premise for the book). In its own way, the novel is a nineteenth-century ‘road novel’. 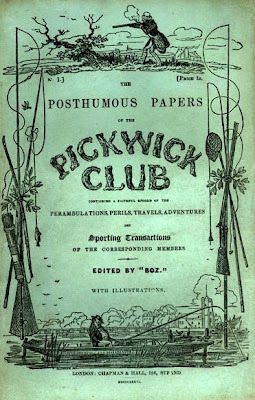 The Pickwick Club ambles around the countryside by coach – engaged in the sort of amusing exploits of a typical picaresque novel. In this regard, Dickens was paying homage to some of the favourite books of his youth – Smollett’s Roderick Random and Humphrey Clinker, and Henry Fielding’s Tom Jones. And, ultimately, it looks back to that early, seminal, picaresque masterpiece, Cervantes’ Don Quixote – especially in the relationship it draws between the innocent Pickwick and his practical valet, Sam Weller, who, by contrast, and despite his age, is wiser in the ways of the world. They parallel, of course, the friendship between the Don and his sidekick, Sancho Panza. In fact, it was with the introduction of Pickwick’s cockney servant, Sam Weller- in the book’s fourth instalment (Chapter 10) - that the work really began to seize the imagination of the reading public. And this is perhaps one of the most interesting aspects of Dickens’ first novel – the way in which it was delivered to the public, and how that helped contribute to its success. 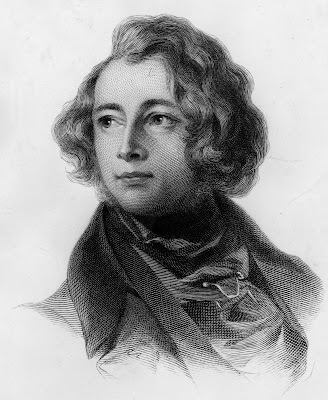 Writing and publishing the book in monthly instalments had several beneficial effects: Dickens could respond almost immediately to the success or failure of individual plot lines, or characters, and adjust the narrative accordingly; he could add incidents and conversation that would hold topical interest; and he could generate future sales by adding elements of suspense to the conclusion of each monthly instalment. And the audience for these monthly issues was growing steadily. Literacy was expanding rapidly – especially amongst the middle-class. Working-class people, who were fascinated by an author who seemed to understand their lives and their concerns - and who loved characters like Sam Weller - could combine resources and share a monthly issue. They would sit around in extended family groups, as one of them read the latest issue to the rest. And advances in technology and transportation meant that these sorts of weekly and monthly publications from London could be dispersed rapidly across the country to an eager audience. The first instalment of The Pickwick Papers was a run of some 400 copies; by the time they got to the fifteenth, Chapman and Hall were printing 40,000 copies per month. And if you really want to know whether the book was successful, check the advertising; just like a modern magazine, these periodicals included paid advertising. By the ninth instalment, there were more pages of ads (39) than there were of text (31)! Dickens and his publishers had a phenomenon on their hands. It’s evident fairly soon into the work, that The Pickwick Papers is a shapeless mess. He throws stuff into the book quite wantonly – whatever seems to suit his fancy and interest. The style and demeanour of the opening chapter (reflecting the publishers’ original idea for the book) is quickly abandoned. He jumps precipitously into the melodrama of a duel in only the second chapter. And he begins to insert now and then, quite artificially, melodramatic tales which interrupt the story and bear no relation at all to theme or plot-line. It’s like he’s not quite sure how to move away from the familiar world of his Sketches (and their Tales) and into the reasonably well-structured plot of a novel. And, really, this continues through the book, but it comes to matter much less as he proceeds - as he gains better control of the material and creates a deep human sympathy for his two central characters, Pickwick and Weller. Samuel Pickwick - names were always important to Dickens – is based loosely on a coaching proprietor from Bath, called Moses Pickwick. 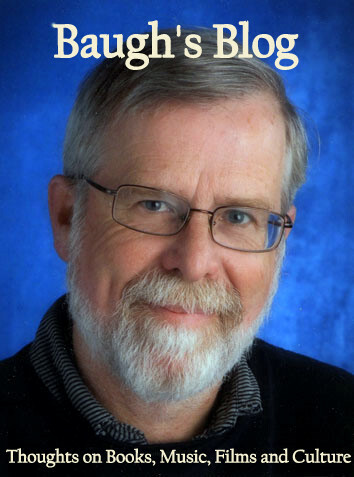 The central character of the book – the esteemed leader of his eponymous club – is merely humorous in the early sections. He is a retired businessman, with plenty of money to fund his adventures and to support the activities and travels of his club – it’s really just three others who stick with him as they venture out into the English countryside. As the book progresses, it takes on a more serious tone; and by the end, Pickwick morphs from a rather silly buffoon into the embodiment of benevolence. He suffers tribulations: the landlady at his digs in London, Mrs. Bardell, is under the mistaken impression that he has proposed marriage; and when the marriage fails to happen, she sues him for breach of contract – egged on by the unscrupulous London law firm of Dodson & Fogg. There is a marvellously satirical set-piece describing the ensuing court-case. Pickwick loses and he is ordered to pay costs and provide damages of £1,500 to Mrs. Bardell. He is incensed by the behaviour of the conniving lawyers and refuses to pay a penny – even though he is then incarcerated at Fleet Prison for three months. The seven chapters that tell the story of Pickwick’s experiences in Fleet (about three-quarters of the way through the book) shift the focus from humour and picaresque adventure to social realism. Dickens here is remembering the experiences of his own father, who was consigned to the Marshalsea debtors’ prison in 1824, when Charles was just 12 years old. He brings to bare here some biting satire about the legal system of the day – many elements of which he had a deep knowledge about. The whole episode adds some gravitas to the tone of the book as it winds towards its close. The Pickwick Papers is set in the 1820s – the last decade before the arrival of the railways. The Pickwick Club moves around the country by coach; and the novel is of particular interest for its detailed portrait of the hospitality on offer by the coaching inns dotted around the country. Their days were numbered. They were there to provide fresh teams of horses for coaches making long-distance journeys, and to provide food and lodging for those breaking those long trips with overnight stays. 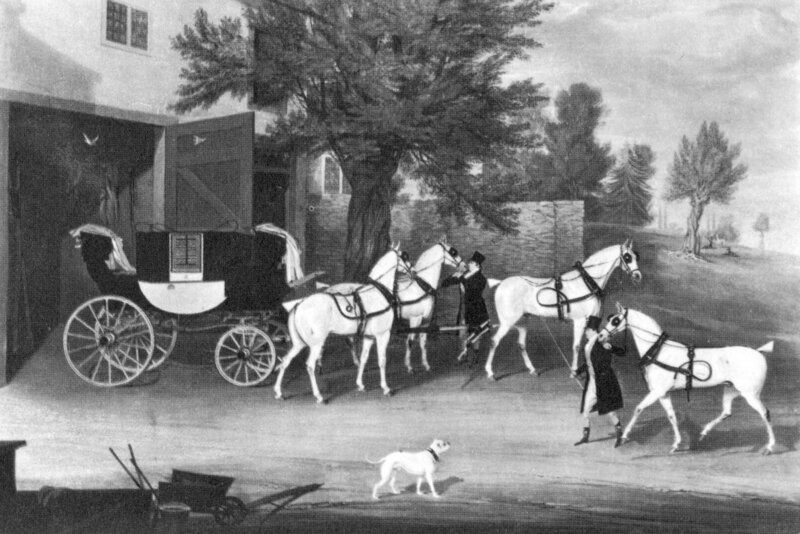 As the Club moves from London to Rochester, to Bath, to Bristol, to Birmingham – we learn all manner of things about coach travel in this Regency era – before Victorian railways swept it all away. And every pause along the way of these coach journeys seemed to require a hearty meal and several rounds of potations. The book provides a lot of colour and incident about the social activities of the day. We get an idyllic account of a snow-bound Christmas celebration at the Wardles’ Manor Farm in Dingley Dell. We read of a military tattoo at a bivouac. We are taken to Bath and learn how the gentry imbibe the health-restoring waters of the spa, and how they socialise of an evening at dinners and dancing Balls. We join picnics and shooting parties and hear of duels and card parties. And the book is full of merriment (a hallmark of Dickens) - lots of eating and drinking: parties, pub-visits, picnics, dinners, feasts, and toasts. This is a comic novel, with lots of funny set-pieces, What stays with you as you reach the end of your time with the Pickwick Club is a sense of well-being - that all is right with the world. Dickens throws up a contrast between the seamier side of life in his day (the Fleet Prison) and the idyllic world he longed to see. Many familiar themes are present here - themes that would appear again and again in the books to come: the struggle between law and justice (seen sometimes as comedy, sometimes as farce, sometimes, even, as tragedy), the essential value of family life, and the need to reform the legal system and social institutions. But the sunny side wins out; good feelings triumph; different social classes (represented by the middle-class Pickwick and the working-class Sam) live in mutual harmony and respect; fathers and sons become reconciled. 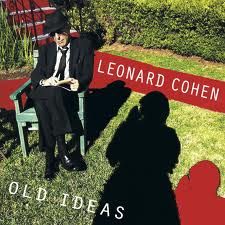 Old-fashioned virtues of kindliness, friendship, honour and conviviality win out. 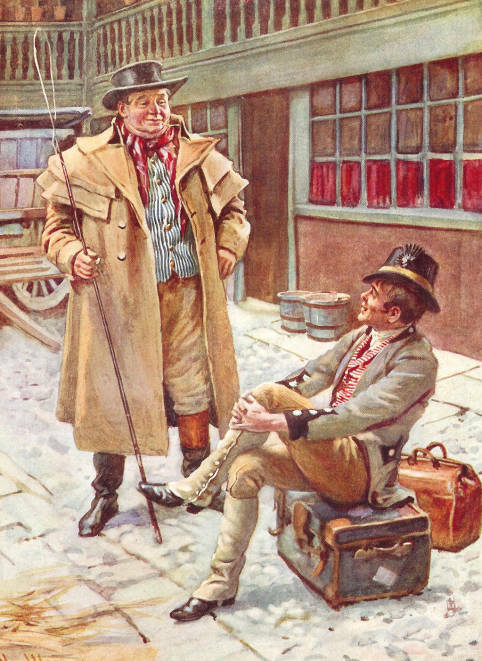 The image of Mr. Pickwick remains: a middle-aged man full of youthful enthusiasm; a middle-class businessman outraged by social injustice; a generous patriarch bestowing his kind attention and concern on all those he loves and cares for. This was Dickens first novel and, despite some weaknesses in the structure and some flabbiness in the content, it remains a defining masterpiece. For many decades after its release, it was one of the most popular and best-loved books in the English language. Really nice blog .I am enjoying read this article. I have enjoyed reading your review Clive. I have just finished reading Pickwick Papers myself, rather slowly I must admit. I found so many scenes so hilarious I reread bits as I went along. Yes I agree it is a little disjointed and changes in quality and texture as it progresses. It is almost as though Dickens is developing a style as he is writing. I too have been wondering about the stories inserted at various intervals, such as The Bagmans Story. At first I tried to think it was a sort of Canterbury Tales idea where different characters relate a story and the whole are linked loosely as morality tales. Then I thought maybe they have some relation to the book as a whole but they don't appear to. As you say there is a randomness about them. Dickens was just having fun and not too worried about content it seems. Very good review and I would recommend Pickwick Papers for the hilarious situations if nothing else. The scene at the convent at Bury St Edmunds or the elections at Eatenswill are priceless.